2014 Football World Cup Preview – Part 4 – Here to the Bitter End! Getting ready for sleep deprivation mode? Wayne Rooney – As usual a lot will hinge on Wayne Rooney’s ability to find the back of the net. He was in golden form this year for Man U but controversy is never far away from him. If he hits the ground running his performance will inspire those around him. Otherwise it will be curtains for England. Among the three ghosts said to haunt Athelhampton House, one of them is an ape. C – Carbon – Carbon can exist with several different 3 dimensional structures in which its atoms are arranged differently (allotropes). Three common crystalline allotropes are graphite, diamond, and (usually) fullerenes. For once England isn’t entering this tournament with the crushing weight of expectation (although that is never far away). I like the squad they have chosen. It is a useful mix of experience (Gerrard, Lampard and Rooney) with exciting new talent (Sturridge, Sterling and Wilshere). They’ve gone for a youth policy this time, which could work for them…maybe. They are in a Group of Death which could end in tears. 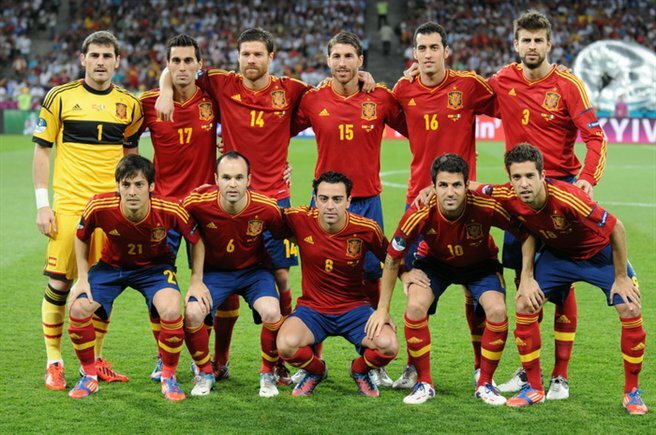 In the end I think this team will have a better chance at the next World Cup. West Bromwich Albion – Go the Baggies! Andrea Pirlo – Pirlo is the artisan in midfield that Italy will rely heavily on to progress in this World Cup. Whether it be to generate attacking impetus through his masterful passing game or his expertise at the set piece how far Italy progresses in this tournament will largely fall on his experienced shoulders. Nb – Niobium – Shiny white ductile metal. High resistance to heat and wear. Italy progressed to the World Cup on the back of an undefeated campaign in qualification but enter this tournament with fairly lacklustre recent form with six draws and a loss in their last 7 games. I wouldn’t read too much into this though. Italy are notoriously indifferent to friendly matches and like Spain are a very experienced team which will rise for the important fixtures (third place finish in Confederations Cup for example). They will rely heavily on club combinations and their experience to progress deep into the tournament. It would be a big ask for them to win the whole thing but they are there and thereabouts and they have less flaws than some of the more favoured teams. Torino (only because it reminds me of Gran Torino). Paul Pogba – France has so much attacking talent it was hard to narrow this down but Pogba the 21 year old phenom from Juventus gets the nod this time. He is one of the most promising X-Factors in a team full of X-Factors. France is the second biggest consumer of medicine in Europe and the second biggest consumer of alcohol in the world (no surprises there). Ta – Tantalum – Rare, shiny, grey, dense metal. It is highly ductile. High resistance to heat and wear. France is as always an enigma. Which French team will turn up is anyone’s guess. They will miss Ribery but have talent right across the park from one of the best goalkeepers in the World in Lloris to one of the most exciting attacking talents in Benzema. They have a creative midfield as well with Pogba and Cabaye to drive their attack. They could do anything from win the whole thing to get knocked out in the first round. Absolutely anything is possible. They are in an interesting group but it is hardly a group of death (Switzerland, Ecuador and Honduras). I think they will go deep into the tournament though winning the whole thing might be a bit beyond them…unless Awesome France turns up…then watch out. Lille – Just like the sound of it. Eden Hazard – One of the brightest talents in Europe, Hazard should light up the World Cup with his enterprising midfield play. Whether he is scoring himself or setting up his star studded forward line this should be the first in a long line of tournaments where he pushes Belgium to the championship rounds. Belgium has the most comic makers per square kilometre in the world. Ti – Titanium – Pure titanium is a light, silvery-white, hard, lustrous metal. It has excellent strength and corrosion resistance and also has a high strength to weight ratio. So underrated they have become overrated, Belgium is probably the most exciting team in the competition absolutely full of young talent like Lukaku, Hazard and Kompany. The only issue Marc Wilmots has is deciding who will take the field. Probably the major thing weighing against a Belgium victory (apart from the location and their youthfulness) is the curse of the Golden Generation. Whenever a team is endowed with such talent very rarely do they end up playing to their full potential. Potential is by its very nature not yet fulfilled. That being said, I’m still excited to see how they go. They are in one of the easiest groups and should progress top, however, sudden death is where we will truly see what this team is made of. This won’t be their last chance. Standard Liege – I’m surprised they didn’t go with Special Liege or Extra Special Liege. Xavi Hernandez – You could have chosen one of a number of players from their talented midfield but Xavi is a superstar in his own right. One of the wisest heads in the squad, there is much talk that he isn’t the player he once was, however, he is still the key to Spain’s possession based strategy. He will be crucial to their chances of repeating. Ag – Silver – Silver is a soft, ductile, malleable, lustrous metal. It has the highest electrical and thermal conductivity of all metals. Spain is one of the few Golden Generations that have actually squeezed every drop of potential into performance with a torrent of trophies including a World Cup, European Championships, Spanish titles and Champions Leagues for club and country to show for it. Impressively they are still at the top of their game but for how much longer. With an All-Universe midfield and the possession strategy which carried them so far, the question on everyone’s lips is ‘can they do this one last time’? Like a World Heavyweight champion there is an impressive list of contenders nipping at their heels. Was their clinical defeat to Brazil in the Confederations Cup Final the beginning of the end or was this the wake up call they needed to pull out their best once again. The margin for error is narrow and questions abound especially in respect of the men up front. It was a toss up between Real Madrid and Atletico Madrid but I think Atletico narrowly shades Real (unlike the Champion’s League final). Mesut Ozil – Ozil became my favourite player during the 2010 World Cup. From the moment I saw him unlocking Australia’s aging defence in the first game I knew I was going to enjoy this for the next three, possibly four World Cups and he hasn’t disappointed. He flagged towards the back end of the long English season but I expect him to be one of the players of the tournament. Germany has more zoos than any other country in the world. W – Tungsten – Very hard, silvery white metal. Highest melting point of all the metals and highest tensile strength. This German team is loaded and has stars right across the paddock. From Neuer in goal, Lahm at the back, Ozil and Schweinsteiger in the middle and Mueller and Podolski up front this team is primed for a deep run in this World Cup with a fan base impatient for success. Four years ago their performance surprised many, however, this World Cup all of their young stars have had further seasoning and will use their big tournament experience to great effect. They should top their group despite the presence of Portugal, Ghana and the USA and after that anything could happen. Their likely round of 16 matchup with Russia is also winnable. The only things standing in their way are the fact they are playing in South America and the fact they have to go through both Brazil and Argentina to win the Cup. Still if anyone can, the Germans can. Freiburg – I don’t know whether this is because of my affinity towards fried food but I like the sound of this team. Lionel Messi – This was an easy one. Argentina is talented across the park but Messi is one of the most talented players in the World, let alone Argentina. Will this be his World Cup? The talented striker hasn’t had the easiest run at previous World Cups and it is probably the only blight on his copy book after a stellar career at Barcelona. Argentina has the most psychologists per capita in the world. No doubt they will be on standby this month. Au – Gold – It is a soft, yellow, metal with a beautiful lustrous sheen. It is the most malleable and ductile of all the elements and a single gram can be beaten into a sheet one square meter sheet of gold leaf. Argentina has a front three that most countries only dream about and should have no trouble scoring goals (especially in the group stage), however, behind Messi, Higuain and Aguero things get a little dicey and that is what is making this World Cup fascinating viewing. Every team has a flaw of some description that it must overcome to hoist the trophy. Argentina will have to be water tight at the back to win during the knockout phase when teams begin to play tighter and chances become more scarce. Argentina will view anything less than a semi-final position as a failure and rightly so. Based on talent alone and the fact that the tournament is in South America, they should make the final and have every chance of unseating the Brazilians (especially if they get the yips). Newell’s Old Boys – Sounds like a team from the Lancashire Pub League. Neymar – The Brazilian team are deserved favourites on home turf and Neymar is primed to shine. The World class striker is not defined by his stats but they are revealing to read. At only 22 he has scored 31 goals and 22 assists in only 49 appearances for his country and has scored an absolute avalanche of goals for Santos and Barcelona over the years to go with that international success. His importance cannot be understated to Brazil’s campaign. Brazil has the most species of monkey in the world. Pt – Platinum – Platinum is a precious metal; soft, silvery-white, and dense with a beautiful lustrous sheen. It is malleable and ductile and has a high melting point. Despite their penchant for beautiful football, Brazil is a team that likes to play through the middle pressing at a rapid pace after winning the ball. They aren’t unbackable favourites but their odds are very short none-the-less. With strengths all over the park one of their few weaknesses is in goal (as compared to other sides). Brazil should win the whole thing. They aren’t in the toughest group and should win against all three teams in their group, however, they will most likely come up against the Netherlands or Spain in the next round so things get serious fairly early on for them. They will be encouraged by their performance in the Confederations Cup (especially their decimation of Spain), however, the whole nation will be holding their breath any time Neymar hits the ground. They will have home support every second of the tournament as well. Conversely, the pressure of so much home support can also lead to underperformance in rare cases (like in 1950 when they last hosted the World Cup). It will be fascinating to see how it all plays out. Fluminense – Would make a good heavy metal band name as well. Just a thought. Rabbitohs and Roosters – The engines are finally starting to warm up, no doubt aided by fairly minimal involvement in State of Origin. Tyrone Peachey – Back to back starring roles. He may end up being the buy of the season. Broncos, Tigers and Eels – Just refusing to go away. Benji Marshall – He has been a lightning rod for criticism but he turned back the clock for one last masterclass. St George will be hoping there is more where that came from. Some props for Matthew Delladova over Kyrie Irving at the Cleveland Cavaliers. Love advanced metrics. Cowboys away form. They were brave but lacked a bit of execution at the back end. Oh and they left it a bit late as well. The English Rugby Union team were being widely touted as the worst England team ever to grace the land of the long white cloud but the critics were forced to put away their knives for another week. A rusty All Blacks team barely held them off. Tyrone Peachey – Run Metres – 233m, Tries – 1, Try Assists – 2, Tackle Breaks – 4, Tackles – 18, Offloads – 2, Line Breaks – 2, Errors – 0 and Times Cronulla have regretted letting him go – 1,000,000. This entry was tagged Advanced Metrics, Australia, Basketball, FIFA, Football, NBA, New Zealand, NRL, Rugby League, Rugby Union, Soccer, World Cup. Bookmark the permalink.